Lots of exciting news from Easy Kids Recipes! 2. Halloween Recipe Contest - Prizes to be Won! Thanks for sending in some wonderful lunch recipes. Rachel Upton's recipe, Cheese...Urry Scones won the Healthy Lunch recipe contest. So what is a scone? First, scone can be pronounced two ways, "skon" or "skoan". These quick breads originated in Scotland and can be sweet or savory. They are similar to American biscuits. Try these delicious cheese scones for lunch some time. Sieve flour, curry powder and baking powder together. Rub in butter (should look like fine breadcrumbs). Add grated cheese. Stir in yogurt and a dash of milk, and mix (should be soft but not sticky). Put on floured board, roll out to 3/4 inch thick. Cut into rounds and place on greased tray. Brush with egg and sprinkle grated cheese. Bake 12 minutes. There is a lot of excitement about Halloween. If you have a great recipe from last year, enter it now and upload 1 to 4 pictures of your recipe. Or be sure and take a photo of your recipe this year on Halloween. Not only will others enjoy your recipe, but you can also win a $100 e-gift certificate (or 2!). Each category winner will win a prize. Prizes: There will be one $100 Gift Card to be won for each category. The winner of each category may choose a gift cart from fatbraintoys.com, walmart.com, or amazon.com. Entries close at midnight EST on November 6, 2010. Click here for contest details and to enter your Halloween recipe. I can't wait to see all the fun and spooky recipes. My four children are all really having a great time cooking at home, following set recipes and making up some of their own. 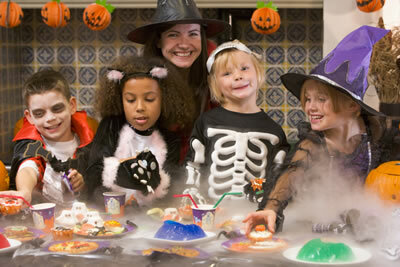 Now you can meet my kids on the Easy Kids Recipes website. Mary Grace is a teenager and she'll be adding some recipes of her own to the website. She has a Teen Cooking Discussion Board, so if you're a teenager, say hi and share your ideas. You can also see my other children: Thomas, Therese and Luke. So say hello and send in a recipe. Join the Easy Kids Recipes community on Facebook for recipes, contests, cooking ideas, discussions and more! Click here to join us on Facebook. Happy and Healthy Kid Cooking!